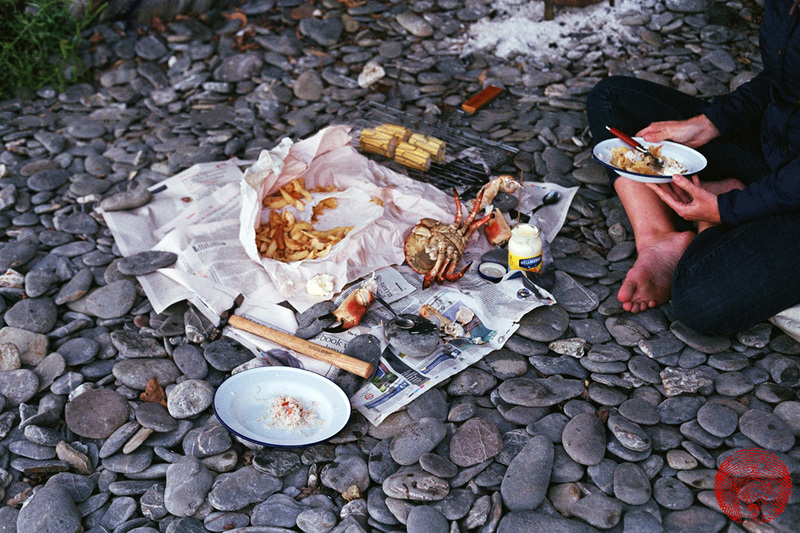 Buy yourself a cooked crab, preferably from the small boat fisherman who hauled in the pot. I picked one up for about £5 from the fisherman who’s cold store is at the top of the hill coming up from Chapel Porth beach near St Agnes in Cornwall. If you’re near Port Isaac (Cornwall) then you’ll be spoilt for choice. You don’t want a picked or dressed crab though, as that takes away most of the fun involved with this grown-up finger food. Pack a camping bowl, fork and teaspoon for each person, nut-crackers (if you have any), an old newspaper, a jar of mayonnaise, the remains of a block of butter, a fish-grill rack and corn-on-the-cob (from your fridge at home, or stop by a shop on your way to the beach). Go to your shed and grab a pin hammer or a small axe and some firewood. On your way to the beach, stop at a fish&chip take-away and buy a large portion of chips to share. Get to the beach and find your spot. Light a small fire (we have a little fire pit that we take with us, the size of a large cake-tin) if it’s possible to do so without ruining someone else’s enjoyment of the beach, and spread out the newspaper using pebbles to stop it form blowing away in the wind. Sandwich the sweetcorn cobs in the fish grill and cook them over the hot coals. Open the chips and jar of mayonnaise. Start pulling limbs off your cooked crab and use the pin hammer or the back of the axe to get at the meat inside, then get to work with the thin handle of your teaspoon to get all of the white meat out of the legs, claws and shoulders. 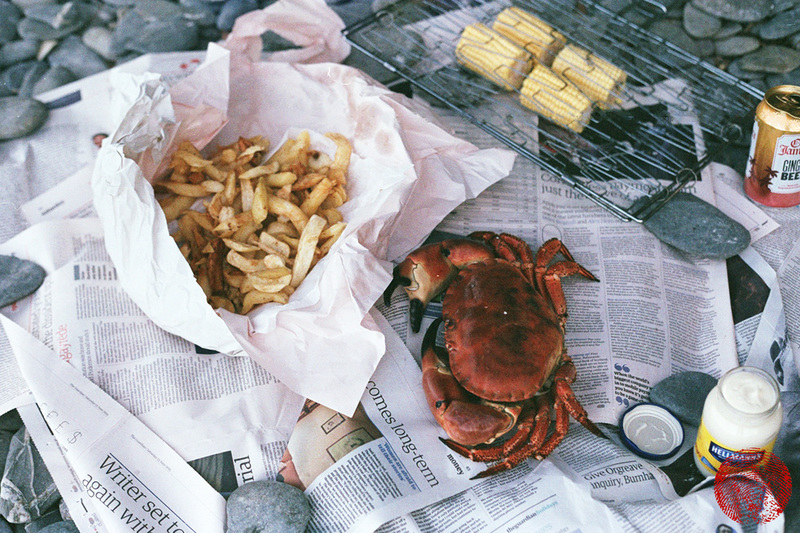 Wipe you hands on a piece of newspaper then wrap all of the crab shells, greasy chip paper and other waste up in the newspaper to take home and put in the bin. Throw a few more pieces of wood on the fire and enjoy the rest of your evening on the beach as the sun sinks into the sea.